Looks like I forgot to blog about this one a while ago! I listened to this book while we were getting our house ready to rent, and I somehow missed it. I listened to it back in July. 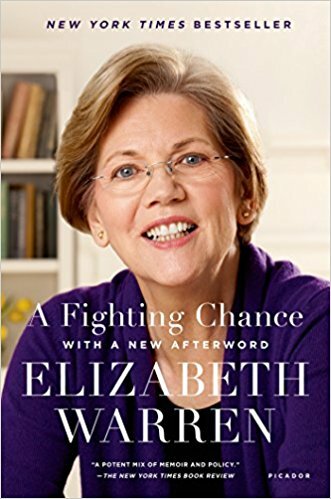 This was the story of Elizabeth Warren, who is the senator from my great state of Massachusetts. This wasn't her newest book (she had one come out in April of this year), but it was the one I wanted to read. Elizabeth Warren grew up in a small town in Oklahoma. She wanted to become a school teacher. But she got married young and got pregnant quickly, and that dream was out of reach. The marriage ended in divorce, and Elizabeth was left with young children and a passion for the low and middle class. She quickly started to see how people get into financial trouble, and started a fight for bankruptcy laws. She fought big banks and big Washington for 10 years....and lost. Finally - at age 62 - she ran for public office and won. Now is fights in Washington for the people and against big banks who have become predators to working class Americans. I MAY have a girl crush on Elizabeth Warren. We lived in Massachusetts for 6 years, and she has been the Senator for most of our time there. She is a powerhouse. She is an amazing person who is passionate and not afraid to speak her mind. She does not hide behind politics - she fights against them. I watched her show up in the middle of the night at the Logan Airport in Boston when Donald Trump starting denying Muslims entrance back into our country even though they lived here. She stands with you and for you. Okay -soap box out. The book was GREAT. She covers her life from childhood to present (2015). She got remarried later in life to a wonderful man. She talks just as passionately about her dogs as she does bankruptcy laws, so we get to see two sides of her. She is deeply devoted to her family and to her job. This was a good read. I am hoping to read more about her in the years to come.